Austin is home to a wide variety of birds year-round, but it’s also ideally situated along the migration path of many avian visitors from afar. Here are some of the best places to see resident and migrant birds around Austin. If you’re new to Austin, the best way to enjoy these sites is to join a guided tour led by the Travis Audubon group. The club also hosts bird counting expeditions, field trips and informal classes and seminars geared toward both novice and expert bird watchers and nature lovers. Located next to the Hornsby Bend Biosolids Management Plant, Hornsby Bend Observatory is the premier birding site in central Texas. Though the wastewater plant does produce an occasional strong smell, you’ll soon forget it about it as you enjoy the abundant bird life. The birds are attracted to this site along the Colorado River for its overall biodiversity and variety of habitat types. Herons, hawks, egrets and vultures are frequently spotted here. Encompassing 215 acres in west Austin, Commons Ford Park lies along the banks of Lake Austin. Three miles of trails lead to numerous sites with excellent bird watching prospects. If you’re lucky, you may spot wild turkeys, scissor-tailed flycatchers, wood ducks or ruby-throated hummingbirds. The 1.5-mile trail in Williamson County, just north of Austin, meanders along a slow-moving creek. Sightings at the park have included blue-winged teal, spotted sandpipers, great blue herons and white-eyed vireo. The 360-acre park is just south of the Colorado River in far east Austin. Bald eagles can occasionally be spotted hunting for fish over the water. More common sightings include mallards, wood ducks, downy woodpeckers and monk parakeets. A part of Georgetown’s network of parks, Berry Spring has several ponds and designated bird viewing areas. The four miles of trails include a combination of concrete and minimally developed trails. Fortunate birders might spot the gorgeous bird of prey, the crested caracara, hunting over one of the ponds. More commonly, you may see red-tailed hawks, black-chinned hummingbirds, eastern phoebes and red-eyed vireo. Recognized as an internationally Important Bird Area, the refuge is home to the endangered golden-cheeked warbler and black-capped vireo. The refuge includes thousands of acres, but not all tracts are connected, making access to some areas tricky at times. The sites are also used by scientists carrying out long-term research on wildlife and other environmental issues. 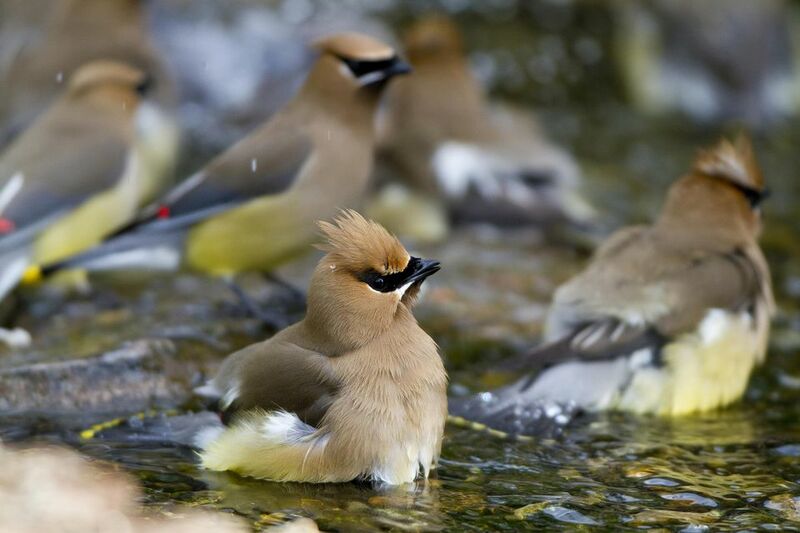 Birds that might be spotted here include the ruby-crowned kinglet, cedar waxwing, spotted towhee and the northern bobwhite. The centerpiece of the park is a swimming hole with a waterfall. The iconic scissor-tailed fly-catcher can often be seen near the waterfall during springtime. The flow varies greatly depending on recent rainfall. Occasionally, park rangers have to prohibit swimming when the swimming hole turns into whitewater. The park also has several miles of trails. If you’re lucky, you may spot the colorful painted bunting. However, you’re more likely to see raccoons, armadillos and deer. Most campsites feature easy access to water, electricity and restrooms. Fish-hunting birds such as the kingfisher and several types of hawks frequent Inks Lake. Unlike many lakes in central Texas, Inks Lake remains at more or less the same level regardless of rainfall. That means it’s a prime destination for boaters, anglers and swimmers. For those who aren’t fond of sleeping in a tent, the park offers 40 air-conditioned cabins. The pink granite throughout the park makes an excellent backdrop for photos. If you’re out early in the morning, you might even get a shot of the park’s resident turkeys. Turkeys and roadrunners are among the most frequently seen birds at Enchanted Rock. The main attraction is the massive hunk of pink granite at the center of the park. Climbing the slick surface can be a little trickier than it appears -- especially after a rain. Following a zigzag pattern will help you keep your footing. While most people simply walk up the hill, some rock climbers do it the hard way, climbing up the steep rock face on one edge. Native Americans once saw the dome as a mystical place, perhaps because it makes mysterious noises at night as the rock cools down. Campsites here do not have electrical hookups, but many have water and showers within walking distance. The quaint German town of Fredericksburg is a short drive away. In winter, eagles are occasionally spotted here, but hawks are far more common. The Pedernales River becomes a beast after heavy rains. During these periods, swimming is prohibited, but the cascading falls are an amazing sight. Instead of one big waterfall, there are several stair-step falls rushing over beige limestone boulders. Coyotes, rabbits and roadrunners are common in the park, and you may even stumble upon a skunk or two. Most campsites have a picnic table, water and electricity. A devastating wildfire in 2011 destroyed much of the park’s signature pine trees. As the trees slowly come back, so do the birds, ranging from cardinals and blue jays to the endangered golden-cheeked warbler. Luckily, the historic cabins built in the 1930s by the Civilian Conservation Corps were saved. Students of ecology will enjoy witnessing nature’s slow recovery process in action. Seedlings are sprouting, and the park abounds with wildflowers in the spring. For the kiddos, the park also has a swimming pool.